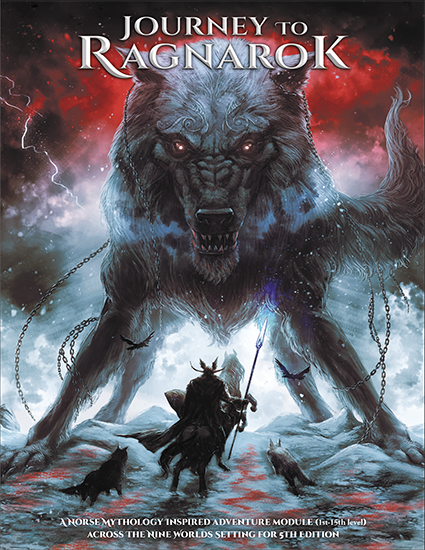 Journey To Ragnarok is an adventure and setting module for characters of level 1st to 15th, inspired by Norse myths and legends, compatible with 5th Edition. It is a captivating adventure that will lead the Heroes from Midgardr through the Nine Worlds. In an epic journey, the fate of men will be tied to that of the gods, until the final moment, the Ragnarok. I just stumbled across this and I think it's fantastic! I was wondering though if the Fantasy Grounds conversion got completed and if you entertained offering it as a separate product. I am happy to buy/convert myself but figured I would verify before pulling the trigger. Hi, It is not complete yet but I am at a good point :). However, I still didn't get authorization from the owner so I cannot make it public. First of all let me say it is a marvel work and I was happy to met all of you at Lucca Comics. However, I have to say that the english version has some (lots :)) typos mistakes. Also stat of NPCs are wrong (Fafnir STR 9 ??) probably it gets swapped with the dwarf and some is not clear if the Traits are already in the AC etc. I am telling you because I am currently converting the pdf to Fantasy Ground for DMing it by VTT, if you are interested to make it public let me know. Where can I get the DM screen? The publisher needs to hire a couple editors for this book. There are tonnes of spelling errors, grammar errors, and just plain broken or vague rules scattered throughout this book. While most of those could be overlooked for the setting and fluff material, the 5e rules and mechanics changes really need another complete lookover. For instance, the Cleric's Sacrifice domain is complete garbage compared to any other existing domain from WotC. The 1st level ability, Ritual of the Honored Sacrifice, lets you permanently mutilate your character to receive a minuscule single-use bonus. For example. You can pull out your eyeball in order to reroll a single ability check, attack roll or saving throw.....once. Doesn't really scream "PLAY ME" does it? The adventures are pretty good, but again, as the DM you'll need to go through them with a fine toothed comb to fix all the rules errors or typos. Not exactly something I'm willing to waste time on right now. Actually, the Ritual can be renewed every day as long as a Cleric renews the blessing upon your mutilation. Does anyone know the difference between these two files? Curious what the Rune Master class looks like. Anyone care to give their thoughts or a brief overview? I've been looking for a good rune based class for 5e for awhile now but haven't been able to find the flavor i want to play. The main thing that stood out for me was a complete lack of subclasses. Not really true. The Aett's are your subclasses. There are 3 of them, that alter the way the classes main features work. I received a notification that a version with bookmarks had been uploaded. I checked out "JTR_-_Impaginato_ENG_DefBM.pdf" but don't see any bookmarks. Just wanted you to be aware. Just bought the game and i noticed something about the 6th level feature of the bard class; the feature doesn't specify if you need to use it as an action (or in combat at all? ), how long the proficiency bonus lasts, if it's your save DC (if you use it on someone else) or if the ability actually should treat anyone failing the test as if under the enthralled spell. It is rather unclear on how this feature is intended to be used. Really nice work! I love the art, design and lore, the adventure is great too. However my critic comes from the monster statbloks. I think for the price of this product you should really have a second look at them, it feels unpolished. I've spotted a good number of inconsistencies and things that seem broken to me (Looking at you Hel, casting finger of death 4 times per round, and you Baldr, immune to every source of damage, or the Svartalfar Warrior with god-like attributes and only a DC 11 on their spells?). Realistically I think you should also trim down the "at will" and per day spell lists of the gods, remove was is redundant and keep a handful of core concept spells. Realistically during a battle they will never cast most of these spells, relying on their most powerful ones. This just clutters the statblok and makes it harder for the DM to run them smoothly. Again, great work on the rest but the statblocks need some polish! What is the difference between the standard heavyweight and premium heavyweight? Also, does the premiem heavyweight have a special cover? Secondary interest would be roll20 support. Are the monsters different than those in the MM? If so are their stats? Does the book contain maps? Or do we have to buy that separate? Yes they are and they do have stats. The book includes map, but if you're looking for a higher resolution we have a separate maps pack! Are there illustrations for every monster/npc statblock? But since the preview only lasted 4 pages, just wondering: How does the quintessentially Asian Monk Class fit into the Quintessentially Icelandic setting of Midgard? "A glimpse. A flash. The prowess of many warriors comes from fine training in martial arts, but your monastic path already granted such feats. By adopting the techniques of Glima, you become a master in controlling your opponents, locking them into close combat and causing pain by twisting arms and legs. You dominate your foes with fast movements, quick defenses and overwhelming strength."